The term cell growth is used in the contexts of biological cell development and cell division (reproduction). When used in the context of cell development, the term refers to increase in cytoplasmic and organelle volume, as well as increase in genetic material following the replication during S phase. This is not to be confused with growth in the context of cell division, referred to as proliferation, where a cell, known as the "mother cell", grows and divides to produce two "daughter cells". 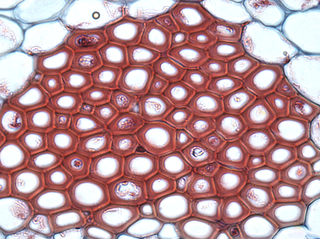 In biology, tissue is a cellular organizational level between cells and a complete organ. A tissue is an ensemble of similar cells and their extracellular matrix from the same origin that together carry out a specific function. Organs are then formed by the functional grouping together of multiple tissues. Genetics is a branch of biology concerned with the study of genes, genetic variation, and heredity in organisms. 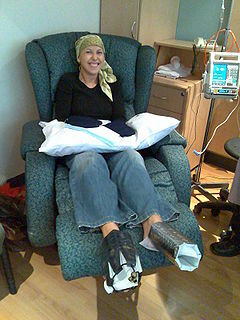 Chemotherapy is a type of cancer treatment that uses one or more anti-cancer drugs as part of a standardized chemotherapy regimen. Chemotherapy may be given with a curative intent, or it may aim to prolong life or to reduce symptoms. Chemotherapy is one of the major categories of the medical discipline specifically devoted to pharmacotherapy for cancer, which is called medical oncology. Radiation therapy or radiotherapy, often abbreviated RT, RTx, or XRT, is therapy using ionizing radiation, generally as part of cancer treatment to control or kill malignant cells and normally delivered by a linear accelerator. Radiation therapy may be curative in a number of types of cancer if they are localized to one area of the body. It may also be used as part of adjuvant therapy, to prevent tumor recurrence after surgery to remove a primary malignant tumor. Radiation therapy is synergistic with chemotherapy, and has been used before, during, and after chemotherapy in susceptible cancers. The subspecialty of oncology concerned with radiotherapy is called radiation oncology. A wheeze is a continuous, coarse, whistling sound produced in the respiratory airways during breathing. For wheezes to occur, some part of the respiratory tree must be narrowed or obstructed, or airflow velocity within the respiratory tree must be heightened. Wheezing is commonly experienced by persons with a lung disease; the most common cause of recurrent wheezing is asthma attacks, though it can also be a symptom of lung cancer, congestive heart failure, and certain types of heart diseases. Weakness is a symptom of a number of different conditions. The causes are many and can be divided into conditions that have true or perceived muscle weakness. True muscle weakness is a primary symptom of a variety of skeletal muscle diseases, including muscular dystrophy and inflammatory myopathy. It occurs in neuromuscular junction disorders, such as myasthenia gravis. Treatment for lung cancer depends on the cancer's specific cell type, how far it has spread, and the person's performance status. Common treatments include palliative care,  surgery, chemotherapy, and radiation therapy. Targeted therapy of lung cancer is growing in importance for advanced lung cancer. Testicular cancer is cancer that develops in the testicles, a part of the male reproductive system. Symptoms may include a lump in the testicle, or swelling or pain in the scrotum. Treatment may result in infertility. Small-cell carcinoma is a type of highly malignant cancer that most commonly arises within the lung, although it can occasionally arise in other body sites, such as the cervix, prostate, and gastrointestinal tract. Compared to non-small cell carcinoma, small cell carcinoma has a shorter doubling time, higher growth fraction, and earlier development of metastases. Adjuvant therapy, also known as adjunct therapy, add-on therapy, and adjuvant care, is therapy that is given in addition to the primary or initial therapy to maximize its effectiveness. The surgeries and complex treatment regimens used in cancer therapy have led the term to be used mainly to describe adjuvant cancer treatments. An example of such adjuvant therapy is the additional treatment usually given after surgery where all detectable disease has been removed, but where there remains a statistical risk of relapse due to the presence of undetected disease. If known disease is left behind following surgery, then further treatment is not technically adjuvant. Non-small-cell lung carcinoma (NSCLC) is any type of epithelial lung cancer other than small cell lung carcinoma (SCLC). NSCLC accounts for about 85% of all lung cancers. As a class, NSCLCs are relatively insensitive to chemotherapy, compared to small cell carcinoma. When possible, they are primarily treated by surgical resection with curative intent, although chemotherapy has been used increasingly both pre-operatively and post-operatively. 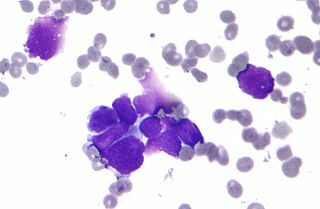 Large-cell carcinoma (LCC) is a heterogeneous group of undifferentiated malignant neoplasms that lack the cytologic and architectural features of small cell carcinoma and glandular or squamous differentiation. LCC is categorized as a type of NSCLC which originates from epithelial cells of the lung. Figitumumab is a monoclonal antibody targeting the insulin-like growth factor-1 receptor that was investigated for the treatment of various types of cancer, for example adrenocortical carcinoma and non-small cell lung cancer (NSCLC). Human papillomavirus-positive oropharyngeal cancer (HPV+OPC) is a subtype of oropharyngeal squamous cell carcinomas (OSCC), associated with the human papillomavirus type 16 virus (HPV16). Historically, cancer of the throat oropharynx (throat) was associated with the use of alcohol and tobacco, but the majority of cases are now associated with the HPV virus. HPV+OPC differs in a number of respects from OPC not associated with HPV (HPV-OPC), and is considered a separate disease. HPV has long been associated with cancers in the anogenital region, but in 2007 it was also recognized as a cause of oropharyngeal cancer. HPV is common among healthy adults and is largely transmitted through sexual contact, but tobacco use increases the risk of cancer. Treatment of lung cancer refers to the use of medical therapies, such as surgery, radiation, chemotherapy, immunotherapy, percutaneous ablation, and palliative care, alone or in combination, in an attempt to cure or lessen the adverse impact of malignant neoplasms originating in lung tissue. HOHMS is the medical acronym for "Higher-Order HistoMolecular Stratification", a term and concept which was first applied to lung cancer research and treatment theory. Adenocarcinoma of the lung is the most common type of lung cancer, and like other forms of lung cancer, it is characterized by distinct cellular and molecular features. It is classified as one of several non-small cell lung cancers (NSCLC), to distinguish it from small cell lung cancer which has a different behavior and prognosis. 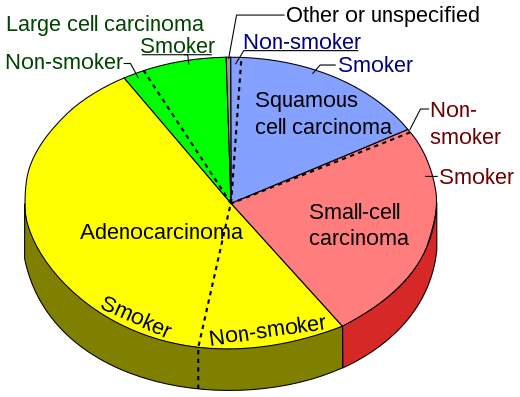 Lung adenocarcinoma is further classified into several subtypes and variants. The signs and symptoms of this specific type of lung cancer are similar to other forms of lung cancer, and patients most commonly complain of persistent cough and shortness of breath. Adenocarcinoma is more common in patients with a history of cigarette smoking, and is the most common form of lung cancer in younger women and Asian populations. The pathophysiology of adenocarcinoma is complicated, but generally follows a histologic progression from cells found in healthy lungs to distinctly dysmorphic, or irregular, cells. There are several distinct molecular and genetic pathways that contribute to this progression. Like many lung cancers, adenocarcinoma of the lung is often advanced by the time of diagnosis. Once a lesion or tumor is identified with various imaging modalities, such as computed tomography (CT) or X-ray, a biopsy is required to confirm the diagnosis. Treatment of this lung cancer is based upon the specific subtype and the extent of spread from the primary tumor. Surgical resection, chemotherapy, radiotherapy, targeted therapy and immunotherapy are used in attempt to eradicate the cancerous cells based upon these factors. Adenosquamous lung carcinoma (AdSqLC) is a biphasic malignant tumor arising from lung tissue that is composed of at least 10% by volume each of squamous cell carcinoma (SqCC) and adenocarcinoma (AdC) cells. 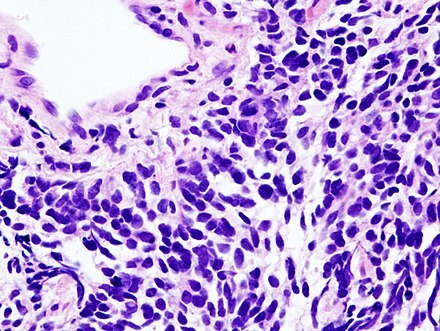 Basaloid squamous cell carcinoma (Bas-SqCC) is an uncommon histological variant of lung cancer composed of cells exhibiting cytological and tissue architectural features of both squamous cell lung carcinoma and basal cell carcinoma. Squamous-cell carcinoma (SCC) of the lung is a histologic type of non-small-cell lung carcinoma (NSCLC). It is the second most prevalent type of lung cancer after lung adenocarcinoma and it originates in the bronchi. Its tumor cells are characterized by a squamous appearance, similar to the one observed in epidermal cells. 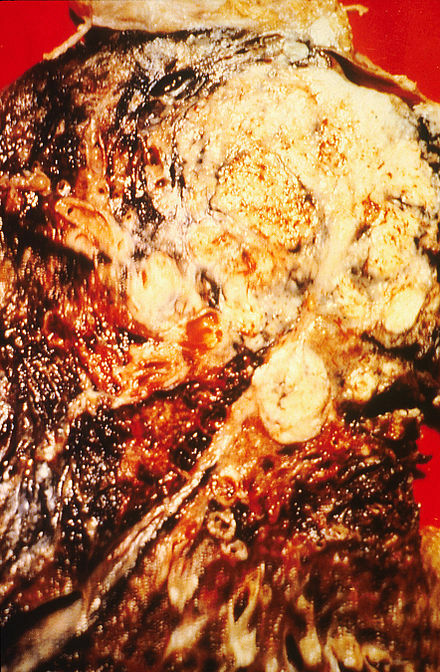 Squamous-cell carcinoma of the lung is strongly associated with tobacco smoking, more than any other form of NSCLC. Carcinoma of the tonsil is a type of squamous cell carcinoma. The tonsil is the most common site of squamous cell carcinoma in the oropharynx. The tumors frequently present at advanced stages, and around 70% of patients present with metastasis to the cervical lymph nodes. . The most reported complaints include sore throat, otalgia or dysphagia. Some patients may complain of feeling the presence of a lump in the throat. Approximately 20% patients present with a node in the neck as the only symptom. 1 2 3 4 5 6 7 8 9 10 11 12 13 14 15 16 17 18 19 20 21 22 23 24 Horn L, Lovly CM (2018). "Chapter 74: Neoplasms of the lung". In Jameson JL, Fauci AS, Kasper DL, Hauser SL, Longo DL, Loscalzo J (eds.). Harrison's Principles of Internal Medicine (20th ed.). McGraw-Hill. ISBN 978-1259644030. 1 2 3 4 5 "Surveillance, Epidemiology and End Results Program". National Cancer Institute. Archived from the original on 4 March 2016. Retrieved 5 March 2016. 1 2 3 "Lung Cancer—Patient Version". NCI. 1 January 1980. Archived from the original on 9 March 2016. Retrieved 5 March 2016. 1 2 3 4 5 6 7 8 Alberg AJ, Brock MV, Samet JM (2016). "Chapter 52: Epidemiology of lung cancer". Murray & Nadel's Textbook of Respiratory Medicine (6th ed.). Saunders Elsevier. ISBN 978-1-4557-3383-5. 1 2 3 O'Reilly KM, Mclaughlin AM, Beckett WS, Sime PJ (March 2007). "Asbestos-related lung disease". American Family Physician. 75 (5): 683–8. PMID 17375514. Archived from the original on 29 September 2007. 1 2 3 4 5 6 7 8 9 10 11 12 13 14 15 Lu C, Onn A, Vaporciyan AA, et al. (2010). "Chapter 78: Cancer of the Lung". Holland-Frei Cancer Medicine (8th ed.). People's Medical Publishing House. ISBN 978-1-60795-014-1. 1 2 3 4 5 6 7 8 9 "Lung Carcinoma: Tumors of the Lungs". Merck Manual Professional Edition, Online edition. Archived from the original on 16 August 2007. Retrieved 15 August 2007. ↑ "Non-Small Cell Lung Cancer Treatment –Patient Version (PDQ®)". NCI. 12 May 2015. Archived from the original on 29 February 2016. Retrieved 5 March 2016. ↑ Falk S, Williams C (2010). "Chapter 1". Lung Cancer—the facts (3rd ed.). Oxford University Press. pp. 3–4. ISBN 978-0-19-956933-5. 1 2 World Cancer Report 2014. World Health Organization. 2014. pp. Chapter 5.1. ISBN 978-92-832-0429-9. ↑ Thun MJ, Hannan LM, Adams-Campbell LL, et al. (September 2008). "Lung cancer occurrence in never-smokers: an analysis of 13 cohorts and 22 cancer registry studies". PLoS Medicine. 5 (9): e185. doi:10.1371/journal.pmed.0050185. PMC 2531137 . PMID 18788891. ↑ "Tobacco Smoke and Involuntary Smoking" (PDF). IARC Monographs on the Evaluation of Carcinogenic Risks to Humans. WHO International Agency for Research on Cancer. 83. 2004. Archived (PDF) from the original on 13 August 2015. There is sufficient evidence that involuntary smoking (exposure to secondhand or 'environmental' tobacco smoke) causes lung cancer in humans. ... Involuntary smoking (exposure to secondhand or 'environmental' tobacco smoke) is carcinogenic to humans (Group 1). 1 2 3 4 5 6 Collins LG, Haines C, Perkel R, Enck RE (January 2007). "Lung cancer: diagnosis and management". American Family Physician. 75 (1): 56–63. PMID 17225705. Archived from the original on 29 September 2007. ↑ "Lung Cancer Prevention–Patient Version (PDQ®)". NCI. 4 November 2015. Archived from the original on 9 March 2016. Retrieved 5 March 2016. ↑ Chapman S, Robinson G, Stradling J, West S, Wrightson J (2014). "Chapter 31". Oxford Handbook of Respiratory Medicine (3rd ed.). Oxford University Press. p. 284. ISBN 978-0-19-870386-0. 1 2 Majumder S (2009). Stem cells and cancer (Online-Ausg. ed.). New York: Springer. p. 193. ISBN 978-0-387-89611-3. Archived from the original on 18 October 2015. ↑ Honnorat J, Antoine JC (May 2007). "Paraneoplastic neurological syndromes". Orphanet Journal of Rare Diseases. 2 (1): 22. doi:10.1186/1750-1172-2-22. PMC 1868710 . PMID 17480225. 1 2 Frederick L G (2002). AJCC cancer staging manual. Berlin: Springer-Verlag. ISBN 978-0-387-95271-0. ↑ Brown KM, Keats JJ, Sekulic A, et al. (2010). "Chapter 8". Holland-Frei Cancer Medicine (8th ed.). People's Medical Publishing House USA. ISBN 978-1-60795-014-1. 1 2 Hecht SS (2012). "Lung carcinogenesis by tobacco smoke". International Journal of Cancer. 131 (12): 2724–2732. doi:10.1002/ijc.27816. PMC 3479369 . PMID 22945513. ↑ Kumar V, Abbas AK, Aster JC (2013). "Chapter 5". Robbins Basic Pathology (9th ed.). Elsevier Saunders. p. 199. ISBN 978-1-4377-1781-5. ↑ Peto R, Lopez AD, Boreham J, et al. (2006). Mortality from smoking in developed countries 1950–2000: Indirect estimates from National Vital Statistics. Oxford University Press. ISBN 978-0-19-262535-9. Archived from the original on 5 September 2007. ↑ "Health effects of exposure to environmental tobacco smoke. California Environmental Protection Agency". Tobacco Control. 6 (4): 346–53. 1997. doi:10.1136/tc.6.4.346. PMC 1759599 . PMID 9583639. Archived from the original on 8 August 2007. ↑ Centers for Disease Control Prevention (CDC) (December 2001). "State-specific prevalence of current cigarette smoking among adults, and policies and attitudes about secondhand smoke—United States, 2000". MMWR. Morbidity and Mortality Weekly Report. 50 (49): 1101–6. PMID 11794619. Archived from the original on 25 June 2017. 1 2 3 Alberg AJ, Ford JG, Samet JM (September 2007). "Epidemiology of lung cancer: ACCP evidence-based clinical practice guidelines (2nd edition)". Chest. 132 (3 Suppl): 29S–55S. doi:10.1378/chest.07-1347. PMID 17873159. ↑ Jaakkola MS, Jaakkola JJ (August 2006). "Impact of smoke-free workplace legislation on exposures and health: possibilities for prevention". The European Respiratory Journal. 28 (2): 397–408. doi:10.1183/09031936.06.00001306. PMID 16880370. ↑ Parkin DM (December 2011). "2. Tobacco-attributable cancer burden in the UK in 2010". British Journal of Cancer. 105 Suppl 2 (Suppl. 2): S6–S13. doi:10.1038/bjc.2011.475. PMC 3252064 . PMID 22158323. 1 2 Taylor R, Najafi F, Dobson A (October 2007). "Meta-analysis of studies of passive smoking and lung cancer: effects of study type and continent". International Journal of Epidemiology. 36 (5): 1048–59. doi:10.1093/ije/dym158. PMID 17690135. Archived from the original on 5 August 2011. ↑ "Frequently asked questions about second hand smoke". World Health Organization. Archived from the original on 1 January 2013. Retrieved 25 July 2012. ↑ Schick S, Glantz S (December 2005). "Philip Morris toxicological experiments with fresh sidestream smoke: more toxic than mainstream smoke". Tobacco Control. 14 (6): 396–404. doi:10.1136/tc.2005.011288. PMC 1748121 . PMID 16319363. ↑ Greydanus DE, Hawver EK, Greydanus MM, Merrick J (October 2013). "Marijuana: current concepts(†)". Frontiers in Public Health. 1 (42): 42. doi:10.3389/fpubh.2013.00042. PMC 3859982 . PMID 24350211. ↑ Owen KP, Sutter ME, Albertson TE (February 2014). "Marijuana: respiratory tract effects". Clinical Reviews in Allergy & Immunology. 46 (1): 65–81. doi:10.1007/s12016-013-8374-y. PMID 23715638. ↑ Joshi M, Joshi A, Bartter T (March 2014). "Marijuana and lung diseases". Current Opinion in Pulmonary Medicine. 20 (2): 173–9. doi:10.1097/mcp.0000000000000026. PMID 24384575. ↑ Tashkin DP (June 2013). "Effects of marijuana smoking on the lung". Annals of the American Thoracic Society. 10 (3): 239–47. doi:10.1513/annalsats.201212-127fr. PMID 23802821. ↑ Underner M, Urban T, Perriot J, de Chazeron I, Meurice JC (June 2014). "[Cannabis smoking and lung cancer]". Revue des Maladies Respiratoires. 31 (6): 488–98. doi:10.1016/j.rmr.2013.12.002. PMID 25012035. ↑ Choi H, Mazzone P (September 2014). "Radon and lung cancer: assessing and mitigating the risk". Cleveland Clinic Journal of Medicine. 81 (9): 567–75. doi:10.3949/ccjm.81a.14046. PMID 25183848. ↑ "Radon (Rn) Health Risks". EPA. 27 August 2013. Archived from the original on 20 October 2008. ↑ Schmid K, Kuwert T, Drexler H (March 2010). "Radon in Indoor Spaces: An Underestimated Risk Factor for Lung Cancer in Environmental Medicine". Dtsch Arztebl Int. 107 (11): 181–6. doi:10.3238/arztebl.2010.0181. PMC 2853156 . PMID 20386676. ↑ EPA (February 2013). "Radiation information: radon". EPA. Archived from the original on 29 April 2009. ↑ Tobias J, Hochhauser D (2010). "Chapter 12". Cancer and its Management (6th ed.). Wiley-Blackwell. p. 199. ISBN 978-1-4051-7015-4. ↑ Davies RJ, Lee YC (2010). "18.19.3". Oxford Textbook Medicine (5th ed.). OUP Oxford. ISBN 978-0-19-920485-4. ↑ Chen H, Goldberg MS, Villeneuve PJ (October – December 2008). "A systematic review of the relation between long-term exposure to ambient air pollution and chronic diseases". Reviews on Environmental Health. 23 (4): 243–97. doi:10.1515/reveh.2008.23.4.243. PMID 19235364. ↑ Clapp RW, Jacobs MM, Loechler EL (January – March 2008). "Environmental and occupational causes of cancer: new evidence 2005–2007". Reviews on Environmental Health. 23 (1): 1–37. doi:10.1515/REVEH.2008.23.1.1. PMC 2791455 . PMID 18557596. 1 2 Lim WY, Seow A (January 2012). "Biomass fuels and lung cancer". Respirology. 17 (1): 20–31. doi:10.1111/j.1440-1843.2011.02088.x. PMID 22008241. 1 2 Sood A (December 2012). "Indoor fuel exposure and the lung in both developing and developed countries: an update". Clinics in Chest Medicine. 33 (4): 649–65. doi:10.1016/j.ccm.2012.08.003. PMC 3500516 . PMID 23153607. ↑ Yang IA, Holloway JW, Fong KM (October 2013). "Genetic susceptibility to lung cancer and co-morbidities". Journal of Thoracic Disease. 5 Suppl 5 (Suppl. 5): S454–62. doi:10.3978/j.issn.2072-1439.2013.08.06. PMC 3804872 . PMID 24163739. ↑ Dela Cruz CS, Tanoue LT, Matthay RA (2015). "Chapter 109: Epidemiology of lung cancer". In Grippi MA, Elias JA, Fishman JA, Kotloff RM, Pack AI, Senior RM (eds.). Fishman's Pulmonary Diseases and Disorders (5th ed.). McGraw-Hill. p. 1673. ISBN 978-0-07-179672-9. 1 2 Larsen JE, Minna JD (December 2011). "Molecular biology of lung cancer: clinical implications". Clinics in Chest Medicine. 32 (4): 703–40. doi:10.1016/j.ccm.2011.08.003. PMC 3367865 . PMID 22054881. ↑ Cogliano VJ, Baan R, Straif K, Grosse Y, Lauby-Secretan B, El Ghissassi F, et al. (December 2011). "Preventable exposures associated with human cancers" (PDF). Journal of the National Cancer Institute. 103 (24): 1827–39. doi:10.1093/jnci/djr483. PMC 3243677 . PMID 22158127. Archived (PDF) from the original on 20 September 2012. ↑ Cooper WA, Lam DC, O'Toole SA, Minna JD (October 2013). "Molecular biology of lung cancer". Journal of Thoracic Disease. 5 Suppl 5 (Suppl. 5): S479–90. doi:10.3978/j.issn.2072-1439.2013.08.03. PMC 3804875 . PMID 24163741. ↑ Tobias J, Hochhauser D (2010). "Chapter 12". Cancer and its Management (6th ed.). Wiley-Blackwell. p. 200. ISBN 978-1-4051-7015-4. 1 2 3 4 Herbst RS, Heymach JV, Lippman SM (September 2008). "Lung cancer". The New England Journal of Medicine. 359 (13): 1367–80. doi:10.1056/NEJMra0802714. PMID 18815398. ↑ Aviel-Ronen S, Blackhall FH, Shepherd FA, Tsao MS (July 2006). "K-ras mutations in non-small-cell lung carcinoma: a review". Clinical Lung Cancer. 8 (1): 30–8. doi:10.3816/CLC.2006.n.030. PMID 16870043. ↑ Kumar V, Abbas AK, Aster JC (2013). "Chapter 5". Robbins Basic Pathology (9th ed.). Elsevier Saunders. p. 212. ISBN 978-1-4377-1781-5. 1 2 Jakopovic M, Thomas A, Balasubramaniam S, Schrump D, Giaccone G, Bates SE (October 2013). "Targeting the epigenome in lung cancer: expanding approaches to epigenetic therapy". Frontiers in Oncology. 3 (261): 261. doi:10.3389/fonc.2013.00261. PMC 3793201 . PMID 24130964. ↑ Takahashi, Nobuaki; Chen, Hsing-Yu; Harris, Isaac S.; Stover, Daniel G.; Selfors, Laura M.; Bronson, Roderick T.; Deraedt, Thomas; Cichowski, Karen; Welm, Alana L.; Mori, Yasuo; Mills, Gordon B.; Brugge, Joan S. (June 2018). "Cancer Cells Co-opt the Neuronal Redox-Sensing Channel TRPA1 to Promote Oxidative-Stress Tolerance". Cancer Cell. 33 (6): 985–1003. doi:10.1016/j.ccell.2018.05.001. PMC 6100788 . PMID 29805077. ↑ Vlahopoulos, Spiros; Adamaki, Maria; Khoury, Nikolas; Zoumpourlis, Vassilis; Boldogh, Istvan (September 2018). "Roles of DNA repair enzyme OGG1 in innate immunity and its significance for lung cancer". Pharmacology & Therapeutics. 194: 59–72. doi:10.1016/j.pharmthera.2018.09.004. PMID 30240635. 1 2 Mulvihill MS, Kratz JR, Pham P, Jablons DM, He B (February 2013). "The role of stem cells in airway repair: implications for the origins of lung cancer". Chinese Journal of Cancer. 32 (2): 71–4. doi:10.5732/cjc.012.10097. PMC 3845611 . PMID 23114089. 1 2 Powell CA, Halmos B, Nana-Sinkam SP (July 2013). "Update in lung cancer and mesothelioma 2012". American Journal of Respiratory and Critical Care Medicine. 188 (2): 157–66. doi:10.1164/rccm.201304-0716UP. PMC 3778761 . PMID 23855692. ↑ Ost D (2015). "Chapter 110: Approach to the patient with pulmonary nodules". In Grippi MA, Elias JA, Fishman JA, Kotloff RM, Pack AI, Senior RM (eds.). Fishman's Pulmonary Diseases and Disorders (5th ed.). McGraw-Hill. p. 1685. ISBN 978-0-07-179672-9. ↑ Frank L, Quint LE (March 2012). 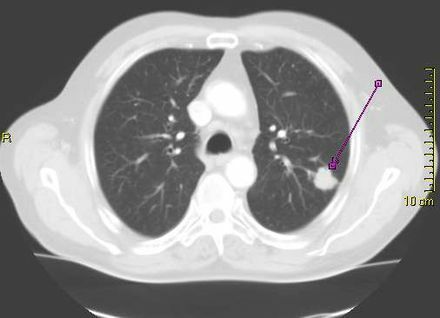 "Chest CT incidentalomas: thyroid lesions, enlarged mediastinal lymph nodes, and lung nodules". Cancer Imaging. 12 (1): 41–8. doi:10.1102/1470-7330.2012.0006. PMC 3335330 . PMID 22391408. 1 2 3 4 5 American College of Chest Physicians; American Thoracic Society (September 2013). "Five Things Physicians and Patients Should Question". Choosing Wisely: an initiative of the ABIM Foundation . American College of Chest Physicians and American Thoracic Society. Archived from the original on 3 November 2013. Retrieved 6 January 2013. ↑ Smokers defined as current or former smoker of more than 1 year of duration. See image page in Commons for percentages in numbers. Reference: Table 2 Archived 10 September 2017 at the Wayback Machine in: Kenfield SA, Wei EK, Stampfer MJ, Rosner BA, Colditz GA (June 2008). "Comparison of aspects of smoking among the four histological types of lung cancer". Tobacco Control. 17 (3): 198–204. doi:10.1136/tc.2007.022582. PMC 3044470 . PMID 18390646. 1 2 Kumar V, Abbas AK, Aster JC (2013). "12". Robbins Basic Pathology (9th ed.). Elsevier Saunders. p. 505. ISBN 978-1-4377-1781-5. ↑ Subramanian J, Govindan R (February 2007). "Lung cancer in never smokers: a review". Journal of Clinical Oncology. 25 (5): 561–70. doi:10.1200/JCO.2006.06.8015. PMID 17290066. ↑ Raz DJ, He B, Rosell R, Jablons DM (March 2006). "Bronchioloalveolar carcinoma: a review". Clinical Lung Cancer. 7 (5): 313–22. doi:10.3816/CLC.2006.n.012. PMID 16640802. ↑ Rosti G, Bevilacqua G, Bidoli P, Portalone L, Santo A, Genestreti G (March 2006). "Small cell lung cancer". Annals of Oncology. 17 Suppl 2 (Suppl. 2): ii5–10. doi:10.1093/annonc/mdj910. PMID 16608983. ↑ Seo JB, Im JG, Goo JM, Chung MJ, Kim MY (1 March 2001). "Atypical pulmonary metastases: spectrum of radiologic findings". Radiographics. 21 (2): 403–17. doi:10.1148/radiographics.21.2.g01mr17403. PMID 11259704. Archived from the original on 11 October 2007. ↑ Tan D, Zander DS (2008). "Immunohistochemistry for Assessment of Pulmonary and Pleural Neoplasms: A Review and Update". Int J Clin Exp Pathol. 1 (1): 19–31. PMC 2480532 . PMID 18784820. 1 2 Connolly JL, Goldsmith JD, Wang HH, et al. (2010). "37: Principles of Cancer Pathology". Holland-Frei Cancer Medicine (8th ed.). People's Medical Publishing House. ISBN 978-1-60795-014-1. ↑ "8th edition lung cancer TNM staging summary" (PDF). International Association for the Study of Lung Cancer. ↑ Van Schil PE, Rami-Porta R, Asamura H (March 2018). "8th TNM edition for lung cancer: a critical analysis". Annals of Translational Medicine. 6 (5): 87. doi:10.21037/atm.2017.06.45. PMC 5890051 . PMID 29666810. 1 2 3 Rami-Porta R, Crowley JJ, Goldstraw P (February 2009). "The revised TNM staging system for lung cancer" (PDF). Annals of Thoracic and Cardiovascular Surgery. 15 (1): 4–9. PMID 19262443. Archived (PDF) from the original on 9 May 2012. ↑ Dela Cruz CS, Tanoue LT, Matthay RA (December 2011). "Lung cancer: epidemiology, etiology, and prevention". Clinics in Chest Medicine. 32 (4): 605–44. doi:10.1016/j.ccm.2011.09.001. PMC 3864624 . PMID 22054876. ↑ Goodman GE (November 2002). "Lung cancer. 1: prevention of lung cancer". Thorax. 57 (11): 994–999. doi:10.1136/thorax.57.11.994. PMC 1746232 . PMID 12403886. ↑ McNabola A, Gill LW (February 2009). "The control of environmental tobacco smoke: a policy review". International Journal of Environmental Research and Public Health. 6 (2): 741–58. doi:10.3390/ijerph6020741. PMC 2672352 . PMID 19440413. ↑ Pandey G (February 2005). "Bhutan's smokers face public ban". BBC. Archived from the original on 7 April 2008. Retrieved 7 September 2007. ↑ Pandey G (2 October 2008). "Indian ban on smoking in public". BBC. Archived from the original on 15 January 2009. Retrieved 25 April 2012. ↑ "UN health agency calls for total ban on tobacco advertising to protect young" (Press release). United Nations News service. 30 May 2008. Archived from the original on 4 March 2016. ↑ Gutierrez A, Suh R, Abtin F, Genshaft S, Brown K (June 2013). "Lung cancer screening". Seminars in Interventional Radiology. 30 (2): 114–20. doi:10.1055/s-0033-1342951. PMC 3709936 . PMID 24436526. 1 2 Usman Ali M, Miller J, Peirson L, Fitzpatrick-Lewis D, Kenny M, Sherifali D, Raina P (August 2016). "Screening for lung cancer: A systematic review and meta-analysis". Preventive Medicine. 89: 301–14. doi:10.1016/j.ypmed.2016.04.015. PMID 27130532. ↑ Jaklitsch MT, Jacobson FL, Austin JH, et al. (July 2012). "The American Association for Thoracic Surgery guidelines for lung cancer screening using low-dose computed tomography scans for lung cancer survivors and other high-risk groups". Journal of Thoracic and Cardiovascular Surgery. 144 (1): 33–38. doi:10.1016/j.jtcvs.2012.05.060. PMID 22710039. ↑ Bach PB, Mirkin JN, Oliver TK, et al. (June 2012). "Benefits and harms of CT screening for lung cancer: a systematic review". JAMA: The Journal of the American Medical Association. 307 (22): 2418–2429. doi:10.1001/jama.2012.5521. PMC 3709596 . PMID 22610500. 1 2 Aberle DR, Abtin F, Brown K (March 2013). "Computed tomography screening for lung cancer: has it finally arrived? Implications of the national lung screening trial". Journal of Clinical Oncology. 31 (8): 1002–8. doi:10.1200/JCO.2012.43.3110. PMC 3589698 . PMID 23401434. ↑ Bach PB, Mirkin JN, Oliver TK, Azzoli CG, Berry DA, Brawley OW, Byers T, Colditz GA, Gould MK, Jett JR, Sabichi AL, Smith-Bindman R, Wood DE, Qaseem A, Detterbeck FC (June 2012). "Benefits and harms of CT screening for lung cancer: a systematic review". JAMA. 307 (22): 2418–29. doi:10.1001/jama.2012.5521. PMC 3709596 . PMID 22610500. ↑ Manser R, Lethaby A, Irving LB, Stone C, Byrnes G, Abramson MJ, Campbell D (June 2013). "Screening for lung cancer". The Cochrane Database of Systematic Reviews. 6 (6): CD001991. doi:10.1002/14651858.CD001991.pub3. PMID 23794187. 1 2 Moyer VA (March 2014). "Screening for lung cancer: U.S. Preventive Services Task Force recommendation statement". Annals of Internal Medicine. 160 (5): 330–8. doi:10.7326/M13-2771. PMID 24378917. ↑ Baldwin DR, Hansell DM, Duffy SW, Field JK (March 2014). "Lung cancer screening with low dose computed tomography". BMJ. 348: g1970. doi:10.1136/bmj.g1970. PMID 24609921. 1 2 3 Fabricius P, Lange P (July – September 2003). "Diet and lung cancer". Monaldi Archives for Chest Disease = Archivio Monaldi per le Malattie del Torace. 59 (3): 207–11. PMID 15065316. ↑ Fritz H, Kennedy D, Fergusson D, Fernandes R, Doucette S, Cooley K, Seely A, Sagar S, Wong R, Seely D (2011). "Vitamin A and retinoid derivatives for lung cancer: a systematic review and meta analysis". PLOS One. 6 (6): e21107. Bibcode:2011PLoSO...621107F. doi:10.1371/journal.pone.0021107. PMC 3124481 . PMID 21738614. ↑ Herr C, Greulich T, Koczulla RA, Meyer S, Zakharkina T, Branscheidt M, Eschmann R, Bals R (March 2011). "The role of vitamin D in pulmonary disease: COPD, asthma, infection, and cancer". Respiratory Research. 12 (1): 31. doi:10.1186/1465-9921-12-31. PMC 3071319 . PMID 21418564. 1 2 Key TJ (January 2011). "Fruit and vegetables and cancer risk". British Journal of Cancer. 104 (1): 6–11. doi:10.1038/sj.bjc.6606032. PMC 3039795 . PMID 21119663. ↑ Bradbury KE, Appleby PN, Key TJ (July 2014). "Fruit, vegetable, and fiber intake in relation to cancer risk: findings from the European Prospective Investigation into Cancer and Nutrition (EPIC)". The American Journal of Clinical Nutrition. 100 Suppl 1 (Suppl. 1): 394S–8S. doi:10.3945/ajcn.113.071357. PMID 24920034. ↑ Sun Y, Li Z, Li J, Li Z, Han J (March 2016). "A Healthy Dietary Pattern Reduces Lung Cancer Risk: A Systematic Review and Meta-Analysis". Nutrients. 8 (3): 134. doi:10.3390/nu8030134. PMC 4808863 . PMID 26959051. ↑ Ferrell B, Koczywas M, Grannis F, Harrington A (April 2011). "Palliative care in lung cancer". The Surgical Clinics of North America. 91 (2): 403–17, ix. doi:10.1016/j.suc.2010.12.003. PMC 3655433 . PMID 21419260. ↑ Chang L, Rivera MP (2015). "Chapter 112: Clinical evaluation, diagnosis, and staging of lung cancer". In Grippi MA, Elias JA, Fishman JA, Kotloff RM, Pack AI, Senior RM (eds.). Fishman's Pulmonary Diseases and Disorders (5th ed.). McGraw-Hill. p. 1728. ISBN 978-0-07-179672-9. ↑ Reznik SI, Smythe WR (2015). "Chapter 113: Treatment of non-small-cell lung cancer: surgery". In Grippi MA, Elias JA, Fishman JA, Kotloff RM, Pack AI, Senior RM (eds.). Fishman's Pulmonary Diseases and Disorders (5th ed.). McGraw-Hill. pp. 1737–1738. ISBN 978-0-07-179672-9. ↑ Alam N, Flores RM (July – September 2007). "Video-assisted thoracic surgery (VATS) lobectomy: the evidence base". JSLS. 11 (3): 368–74. PMC 3015831 . PMID 17931521. ↑ Rueth NM, Andrade RS (June 2010). "Is VATS lobectomy better: perioperatively, biologically and oncologically?". The Annals of Thoracic Surgery. 89 (6): S2107–11. doi:10.1016/j.athoracsur.2010.03.020. PMID 20493991. ↑ Simon GR, Turrisi A (September 2007). "Management of small cell lung cancer: ACCP evidence-based clinical practice guidelines (2nd edition)". Chest. 132 (3 Suppl): 324S–339S. doi:10.1378/chest.07-1385. PMID 17873178. ↑ Goldstein SD, Yang SC (October 2011). "Role of surgery in small cell lung cancer". Surgical Oncology Clinics of North America. 20 (4): 769–77. doi:10.1016/j.soc.2011.08.001. PMID 21986271. ↑ Arriagada R, Goldstraw P, Le Chevalier T (2002). Oxford Textbook of Oncology (2nd ed.). Oxford University Press. p. 2094. ISBN 978-0-19-262926-5. ↑ Hatton MQ, Martin JE (June 2010). "Continuous hyperfractionated accelerated radiotherapy (CHART) and non-conventionally fractionated radiotherapy in the treatment of non-small cell lung cancer: a review and consideration of future directions". Clinical Oncology. 22 (5): 356–64. doi:10.1016/j.clon.2010.03.010. PMID 20399629. ↑ PORT Meta-analysis Trialists Group (April 2005). Rydzewska, Larysa (ed.). "Postoperative radiotherapy for non-small cell lung cancer". The Cochrane Database of Systematic Reviews. 10 (2): CD002142. doi:10.1002/14651858.CD002142.pub2. PMID 15846628. ↑ Le Péchoux C (2011). "Role of postoperative radiotherapy in resected non-small cell lung cancer: a reassessment based on new data". The Oncologist. 16 (5): 672–81. doi:10.1634/theoncologist.2010-0150. PMC 3228187 . PMID 21378080. ↑ Reveiz L, Rueda JR, Cardona AF (December 2012). "Palliative endobronchial brachytherapy for non-small cell lung cancer". The Cochrane Database of Systematic Reviews. 12: CD004284. doi:10.1002/14651858.CD004284.pub3. PMID 23235606. ↑ Paumier A, Cuenca X, Le Péchoux C (June 2011). "Prophylactic cranial irradiation in lung cancer". Cancer Treatment Reviews. 37 (4): 261–5. doi:10.1016/j.ctrv.2010.08.009. PMID 20934256. ↑ Girard N, Mornex F (October 2011). "[Stereotactic radiotherapy for non-small cell lung cancer: From concept to clinical reality. 2011 update]". Cancer/Radiothérapie. 15 (6–7): 522–6. doi:10.1016/j.canrad.2011.07.241. PMID 21889901. ↑ Fairchild A, Harris K, Barnes E, et al. (August 2008). "Palliative thoracic radiotherapy for lung cancer: a systematic review". Journal of Clinical Oncology. 26 (24): 4001–4011. doi:10.1200/JCO.2007.15.3312. PMID 18711191. Archived from the original on 13 April 2013. ↑ Hann CL, Rudin CM (30 November 2008). "Management of small-cell lung cancer: incremental changes but hope for the future". Oncology (Williston Park). 22 (13): 1486–92. PMC 4124612 . PMID 19133604. ↑ Murray N, Turrisi AT (March 2006). "A review of first-line treatment for small-cell lung cancer". Journal of Thoracic Oncology. 1 (3): 270–8. doi:10.1016/s1556-0864(15)31579-3. PMID 17409868. ↑ Azim HA, Ganti AK (March 2007). "Treatment options for relapsed small-cell lung cancer". Anti-Cancer Drugs. 18 (3): 255–61. doi:10.1097/CAD.0b013e328011a547. PMID 17264756. ↑ MacCallum C, Gillenwater HH (July 2006). "Second-line treatment of small-cell lung cancer". Current Oncology Reports. 8 (4): 258–64. doi:10.1007/s11912-006-0030-8. PMID 17254525. 1 2 NSCLC Meta-Analyses Collaborative Group (October 2008). "Chemotherapy in Addition to Supportive Care Improves Survival in Advanced Non–Small-Cell Lung Cancer: A Systematic Review and Meta-Analysis of Individual Patient Data From 16 Randomized Controlled Trials". J. Clin. Oncol. 26 (28): 4617–25. doi:10.1200/JCO.2008.17.7162. PMC 2653127 . PMID 18678835. ↑ Carr LL, Jett JR (2015). "Chapter 114: Treatment of non-small-cell lung cancer: chemotherapy". In Grippi MA, Elias JA, Fishman JA, Kotloff RM, Pack AI, Senior RM (eds.). Fishman's Pulmonary Diseases and Disorders (5th ed.). McGraw-Hill. p. 1752. ISBN 978-0-07-179672-9. 1 2 Clegg A, Scott DA, Hewitson P, Sidhu M, Waugh N (January 2002). "Clinical and cost effectiveness of paclitaxel, docetaxel, gemcitabine, and vinorelbine in non-small cell lung cancer: a systematic review". Thorax. 57 (1): 20–8. doi:10.1136/thorax.57.1.20. PMC 1746188 . PMID 11809985. ↑ Fuld AD, Dragnev KH, Rigas JR (June 2010). "Pemetrexed in advanced non-small-cell lung cancer". Expert Opin Pharmacother. 11 (8): 1387–402. doi:10.1517/14656566.2010.482560. PMID 20446853. ↑ Santos FN, de Castria TB, Cruz MR, Riera R (October 2015). "Chemotherapy for advanced non-small cell lung cancer in the elderly population". The Cochrane Database of Systematic Reviews (10): CD010463. doi:10.1002/14651858.CD010463.pub2. PMID 26482542. ↑ Carbone DP, Felip E (September 2011). "Adjuvant therapy in non-small cell lung cancer: future treatment prospects and paradigms". Clinical Lung Cancer. 12 (5): 261–71. doi:10.1016/j.cllc.2011.06.002. PMID 21831720. 1 2 Le Chevalier T (October 2010). "Adjuvant chemotherapy for resectable non-small-cell lung cancer: where is it going?". Annals of Oncology. 21 Suppl 7 (Suppl. 7): vii196–8. doi:10.1093/annonc/mdq376. PMID 20943614. ↑ Burdett S, Pignon JP, Tierney J, Tribodet H, Stewart L, Le Pechoux C, et al. (March 2015). "Adjuvant chemotherapy for resected early-stage non-small cell lung cancer". The Cochrane Database of Systematic Reviews (3): CD011430. doi:10.1002/14651858.CD011430. PMID 25730344. ↑ He J, Shen J, Yang C, Jiang L, Liang W, Shi X, Xu X, He J (June 2015). "Adjuvant Chemotherapy for the Completely Resected Stage IB Nonsmall Cell Lung Cancer: A Systematic Review and Meta-Analysis". Medicine. 94 (22): e903. doi:10.1097/MD.0000000000000903. PMC 4616365 . PMID 26039122. ↑ NSCLC Meta-analysis Collaborative Group (May 2014). "Preoperative chemotherapy for non-small-cell lung cancer: a systematic review and meta-analysis of individual participant data". Lancet. 383 (9928): 1561–71. doi:10.1016/S0140-6736(13)62159-5. PMC 4022989 . PMID 24576776. ↑ Burdett SS, Stewart LA, Rydzewska L (July 2007). "Chemotherapy and surgery versus surgery alone in non-small cell lung cancer". The Cochrane Database of Systematic Reviews (3): CD006157. doi:10.1002/14651858.CD006157.pub2. PMID 17636828. ↑ Noonan, KL; Ho, C; Laskin, J (November 2015). "The influence of the evolution of first-line chemotherapy on steadily improving survival in advanced non-small-cell lung cancer clinical trials". Journal of Thoracic Oncology. 10 (11): 1523–1531. doi:10.1097/JTO.0000000000000667. PMID 26536194. ↑ Sörenson S, Glimelius B, Nygren P (2001). "A systematic overview of chemotherapy effects in non-small cell lung cancer". Acta Oncologica. 40 (2–3): 327–39. doi:10.1080/02841860151116402. PMID 11441939. ↑ Clegg A, Scott DA, Sidhu M, Hewitson P, Waugh N (2001). "A rapid and systematic review of the clinical effectiveness and cost-effectiveness of paclitaxel, docetaxel, gemcitabine and vinorelbine in non-small-cell lung cancer". Health Technology Assessment. 5 (32): 1–195. doi:10.3310/hta5320. PMID 12065068. Archived from the original on 30 August 2017. ↑ Non-Small Cell Lung Cancer Collaborative, Group (12 May 2010). "Chemotherapy and supportive care versus supportive care alone for advanced non-small cell lung cancer". The Cochrane Database of Systematic Reviews (5): CD007309. doi:10.1002/14651858.CD007309.pub2. PMID 20464750. ↑ D'Antonio C, Passaro A, Gori B, Del Signore E, Migliorino MR, Ricciardi S, Fulvi A, de Marinis F (May 2014). "Bone and brain metastasis in lung cancer: recent advances in therapeutic strategies". Therapeutic Advances in Medical Oncology. 6 (3): 101–14. doi:10.1177/1758834014521110. PMC 3987652 . PMID 24790650. ↑ Lazarus DR, Eapen GA (2014). "Chapter 16: Bronchoscopic interventions for lung cancer". In Roth JA, Hong WK, Komaki RU (eds.). Lung Cancer (4th ed.). Wiley-Blackwell. ISBN 978-1-118-46874-6. ↑ Khemasuwan D, Mehta AC, Wang KP (December 2015). "Past, present, and future of endobronchial laser photoresection". Journal of Thoracic Disease. 7 (Suppl 4): S380–8. doi:10.3978/j.issn.2072-1439.2015.12.55. PMC 4700383 . PMID 26807285. ↑ Parikh RB, Kirch RA, Smith TJ, Temel JS (December 2013). "Early specialty palliative care—translating data in oncology into practice". The New England Journal of Medicine. 369 (24): 2347–51. doi:10.1056/nejmsb1305469. PMC 3991113 . PMID 24328469. ↑ Kelley AS, Meier DE (August 2010). "Palliative care—a shifting paradigm". The New England Journal of Medicine. 363 (8): 781–2. doi:10.1056/NEJMe1004139. PMID 20818881. 1 2 Prince-Paul M (April 2009). "When hospice is the best option: an opportunity to redefine goals". Oncology. 23 (4 Suppl Nurse Ed): 13–7. PMID 19856592. ↑ Ridge CA, McErlean AM, Ginsberg MS (June 2013). "Epidemiology of lung cancer". Seminars in Interventional Radiology. 30 (2): 93–8. doi:10.1055/s-0033-1342949. PMC 3709917 . PMID 24436524. ↑ "Lung cancer survival statistics". Cancer Research UK. 15 May 2015. Archived from the original on 7 October 2014. ↑ "Lung cancer survival statistics". Archived from the original on 9 October 2014. Retrieved 28 October 2014. ↑ PDQ Adult Treatment Editorial Board (2002). "Non-Small Cell Lung Cancer Treatment". PDQ for Health Professionals. PMID 26389304 . Retrieved 17 November 2015. ↑ "Small Cell Lung Cancer Treatment". PDQ for Health Professionals. National Cancer Institute. 2012. Archived from the original on 13 May 2012. Retrieved 16 May 2012. ↑ Spiro SG (2010). "18.19.1". Oxford Textbook Medicine (5th ed.). OUP Oxford. ISBN 978-0-19-920485-4. ↑ Slatore CG, Au DH, Gould MK (November 2010). "An official American Thoracic Society systematic review: insurance status and disparities in lung cancer practices and outcomes". American Journal of Respiratory and Critical Care Medicine. 182 (9): 1195–205. doi:10.1164/rccm.2009-038ST. PMID 21041563. ↑ Stewart BW, Wild CP (2014). World cancer report 2014. Lyon: IARC Press. pp. 350–352. ISBN 978-92-832-0429-9. ↑ Jemal A, Tiwari RC, Murray T, Ghafoor A, Samuels A, Ward E, Feuer EJ, Thun MJ (2004). "Cancer statistics, 2004". Ca. 54 (1): 8–29. doi:10.3322/canjclin.54.1.8. PMID 14974761. ↑ Proctor RN (March 2012). "The history of the discovery of the cigarette-lung cancer link: evidentiary traditions, corporate denial, global toll". Tobacco Control. 21 (2): 87–91. doi:10.1136/tobaccocontrol-2011-050338. PMID 22345227. ↑ Lum KL, Polansky JR, Jackler RK, Glantz SA (October 2008). "Signed, sealed and delivered: "big tobacco" in Hollywood, 1927-1951". Tobacco Control. 17 (5): 313–23. doi:10.1136/tc.2008.025445. PMC 2602591 . PMID 18818225. Archived from the original on 4 April 2009. ↑ Lovato C, Watts A, Stead LF (October 2011). "Impact of tobacco advertising and promotion on increasing adolescent smoking behaviours". The Cochrane Database of Systematic Reviews (10): CD003439. doi:10.1002/14651858.CD003439.pub2. PMID 21975739. ↑ Kemp FB (July – September 2009). "Smoke free policies in Europe. An overview". Pneumologia. 58 (3): 155–8. PMID 19817310. 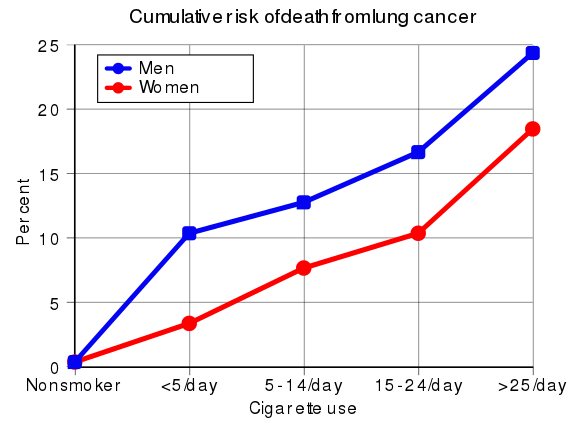 ↑ "Gender in lung cancer and smoking research" (PDF). World Health Organization. 2004. Archived (PDF) from the original on 14 June 2007. Retrieved 26 May 2007. ↑ Zhang J, Ou JX, Bai CX (November 2011). "Tobacco smoking in China: prevalence, disease burden, challenges and future strategies". Respirology. 16 (8): 1165–72. doi:10.1111/j.1440-1843.2011.02062.x. PMID 21910781. ↑ Behera D, Balamugesh T (2004). "Lung cancer in India" (PDF). The Indian Journal of Chest Diseases & Allied Sciences. 46 (4): 269–81. PMID 15515828. Archived (PDF) from the original on 17 December 2008. ↑ "HONORING VETERANS WITH GOOD HEALTH". 7 November 2014. Archived from the original on 28 November 2015. Retrieved 1 December 2015. ↑ "Lung Cancer As It Affects Veterans And Military". Archived from the original on 8 December 2015. Retrieved 1 December 2015. ↑ "Cancer incidence statistics". Cancer Research UK. 13 May 2015. Archived from the original on 2 January 2017. Retrieved 20 December 2016. ↑ "Lung cancer statistics". Cancer Research UK. 14 May 2015. Archived from the original on 12 May 2015. Retrieved 20 December 2016. ↑ Charloux A, Quoix E, Wolkove N, Small D, Pauli G, Kreisman H (February 1997). "The increasing incidence of lung adenocarcinoma: reality or artefact? A review of the epidemiology of lung adenocarcinoma". International Journal of Epidemiology. 26 (1): 14–23. doi:10.1093/ije/26.1.14. PMID 9126499. Archived from the original on 5 December 2008. ↑ Kadara H, Kabbout M, Wistuba II (January 2012). "Pulmonary adenocarcinoma: a renewed entity in 2011". Respirology. 17 (1): 50–65. doi:10.1111/j.1440-1843.2011.02095.x. PMC 3911779 . PMID 22040022. ↑ Morgagni GB (1761). De sedibus et causis morborum per anatomen indagatis. OL 24830495M. ↑ Bayle G (1810). Recherches sur la phthisie pulmonaire (in French). Paris. OL 15355651W. 1 2 Witschi H (November 2001). "A short history of lung cancer". Toxicological Sciences. 64 (1): 4–6. doi:10.1093/toxsci/64.1.4. PMID 11606795. Archived from the original on 9 March 2007. ↑ Adler I (1912). Primary Malignant Growths of the Lungs and Bronchi. New York: Longmans, Green, and Company. OCLC 14783544. OL 24396062M. , cited in Spiro SG, Silvestri GA (September 2005). "One hundred years of lung cancer". American Journal of Respiratory and Critical Care Medicine. 172 (5): 523–9. doi:10.1164/rccm.200504-531OE. PMID 15961694. ↑ Grannis FW. 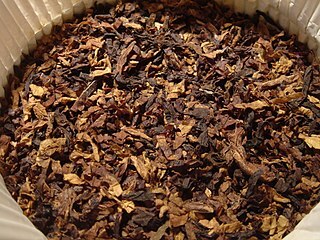 "History of cigarette smoking and lung cancer". smokinglungs.com. Archived from the original on 18 July 2007. Retrieved 6 August 2007. ↑ Proctor R (2000). The Nazi War on Cancer. Princeton University Press. pp. 173–246. ISBN 978-0-691-00196-8. ↑ Doll R, Hill AB (November 1956). "Lung cancer and other causes of death in relation to smoking; a second report on the mortality of British doctors". British Medical Journal. 2 (5001): 1071–81. doi:10.1136/bmj.2.5001.1071. PMC 2035864 . PMID 13364389. ↑ US Department of Health Education and Welfare (1964). "Smoking and health: report of the advisory committee to the Surgeon General of the Public Health Service" (PDF). Washington, DC: US Government Printing Office. Archived (PDF) from the original on 17 December 2008. 1 2 Greaves M (2000). Cancer: the Evolutionary Legacy. Oxford University Press. pp. 196–197. ISBN 978-0-19-262835-0. ↑ Greenberg M, Selikoff IJ (February 1993). "Lung cancer in the Schneeberg mines: a reappraisal of the data reported by Harting and Hesse in 1879". The Annals of Occupational Hygiene. 37 (1): 5–14. doi:10.1093/annhyg/37.1.5. PMID 8460878. ↑ Samet JM (April 2011). "Radiation and cancer risk: a continuing challenge for epidemiologists". Environmental Health. 10 (Suppl. 1): S4. doi:10.1186/1476-069X-10-S1-S4. PMC 3073196 . PMID 21489214. ↑ Horn L, Johnson DH (July 2008). "Evarts A. Graham and the first pneumonectomy for lung cancer". Journal of Clinical Oncology. 26 (19): 3268–75. doi:10.1200/JCO.2008.16.8260. PMID 18591561. ↑ Edwards AT (March 1946). "Carcinoma of the bronchus". Thorax. 1 (1): 1–25. doi:10.1136/thx.1.1.1. PMC 1018207 . PMID 20986395. ↑ Kabela M (1956). "[Experience with radical irradiation of bronchial cancer]" [Experience with radical irradiation of bronchial cancer]. Ceskoslovenska Onkologia (in German). 3 (2): 109–15. PMID 13383622. ↑ Saunders M, Dische S, Barrett A, Harvey A, Gibson D, Parmar M (July 1997). "Continuous hyperfractionated accelerated radiotherapy (CHART) versus conventional radiotherapy in non-small-cell lung cancer: a randomised multicentre trial. CHART Steering Committee". Lancet. 350 (9072): 161–5. doi:10.1016/S0140-6736(97)06305-8. PMID 9250182. ↑ Lennox SC, Flavell G, Pollock DJ, Thompson VC, Wilkins JL (November 1968). "Results of resection for oat-cell carcinoma of the lung". Lancet. 2 (7575): 925–7. doi:10.1016/S0140-6736(68)91163-X. PMID 4176258. ↑ Miller AB, Fox W, Tall R (September 1969). "Five-year follow-up of the Medical Research Council comparative trial of surgery and radiotherapy for the primary treatment of small-celled or oat-celled carcinoma of the bronchus". Lancet. 2 (7619): 501–5. doi:10.1016/S0140-6736(69)90212-8. PMID 4184834. ↑ Cohen MH, Creaven PJ, Fossieck BE, Broder LE, Selawry OS, Johnston AV, Williams CL, Minna JD (1977). "Intensive chemotherapy of small cell bronchogenic carcinoma". Cancer Treatment Reports. 61 (3): 349–54. PMID 194691. 1 2 3 4 Brahmer JR (February 2014). "Immune checkpoint blockade: the hope for immunotherapy as a treatment of lung cancer?". Seminars in Oncology. 41 (1): 126–32. doi:10.1053/j.seminoncol.2013.12.014. PMC 4732704 . PMID 24565586. 1 2 3 4 5 Syn NL, Teng MW, Mok TS, Soo RA (December 2017). "De-novo and acquired resistance to immune checkpoint targeting". The Lancet. Oncology. 18 (12): e731–e741. doi:10.1016/s1470-2045(17)30607-1. PMID 29208439. 1 2 Forde PM, Brahmer JR, Kelly RJ (May 2014). "New strategies in lung cancer: epigenetic therapy for non-small cell lung cancer". Clinical Cancer Research. 20 (9): 2244–8. doi:10.1158/1078-0432.ccr-13-2088. PMC 4325981 . PMID 24644000. 1 2 Jamal-Hanjani M, Hackshaw A, Ngai Y, Shaw J, Dive C, Quezada S, et al. (July 2014). "Tracking genomic cancer evolution for precision medicine: the lung TRACERx study". PLoS Biology. 12 (7): e1001906. doi:10.1371/journal.pbio.1001906. PMC 4086714 . PMID 25003521. ↑ Spaans JN, Goss GD (August 2014). "Trials to Overcome Drug Resistance to EGFR and ALK Targeted Therapies – Past, Present, and Future". Frontiers in Oncology. 4 (233): 233. doi:10.3389/fonc.2014.00233. PMC 4145253 . PMID 25221748. ↑ Weart TC, Miller KD, Simone CB (April 2018). "Spotlight on dabrafenib/trametinib in the treatment of non-small-cell lung cancer: place in therapy". Cancer Management and Research. 10: 647–652. doi:10.2147/CMAR.S142269. PMC 5892608 . PMID 29662327. ↑ Prabavathy D, Swarnalatha Y, Ramadoss N (March 2018). "Lung cancer stem cells-origin, characteristics and therapy". Stem Cell Investigation. 5 (6): 6. doi:10.21037/sci.2018.02.01. PMC 5897668 . PMID 29682513. 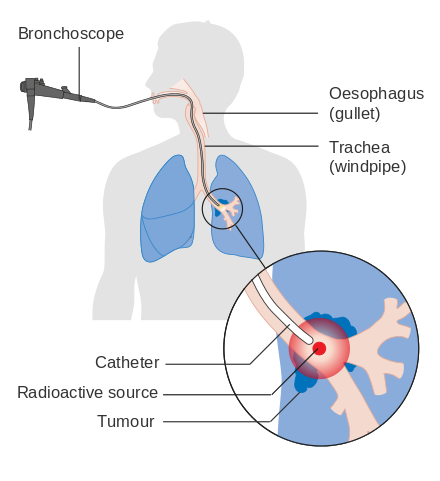 Wikimedia Commons has media related to Cancers of bronchus and lung .